▼ 6 Valentine's Costume Employees appear! 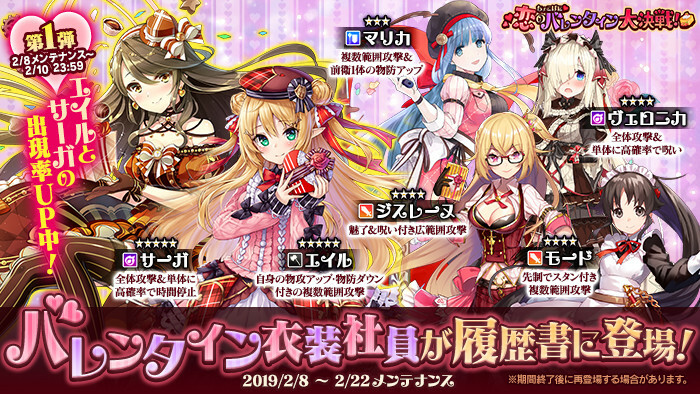 Starting after the 2/8 (Thu) maintenance, new costume employees wearing Valentine's costumes will appear. ※ The above 6 employees will only appear during the [Chocopani♥Valentine Love Battle] event and will have resume appearance rates higher than normal employees. Furthermore, using the [Limited] Chocolate Postbox will increase these chances. 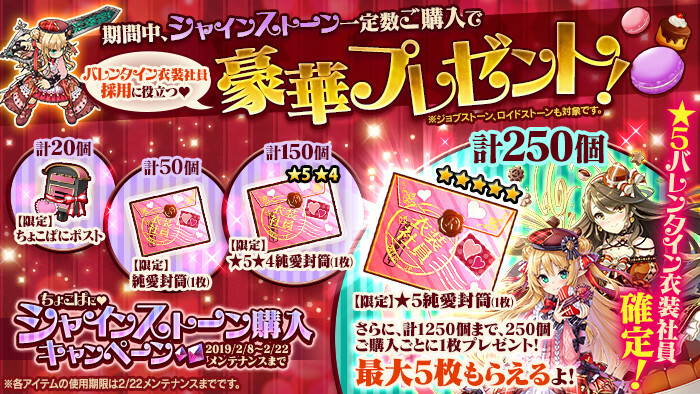 ※ The above 6 employees can be recruited from the rewards received from the [Chocopani♥Valentine Love Battle]. ▼ Log in to receive a ★3 or ★4 Valentine's Costume Employee! 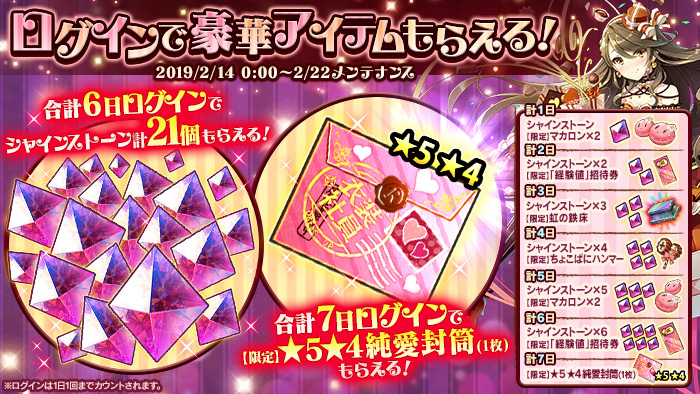 Log in to receive a [Limited] ★3★4 Valentine's Envelope (x4) where you can choose one of the costume employees [Ghislaine], [Maud], [Veronica], or [Marica] for free! This item will be delivered to your in-game mail. ▼ Collect cocoa to help the girls! 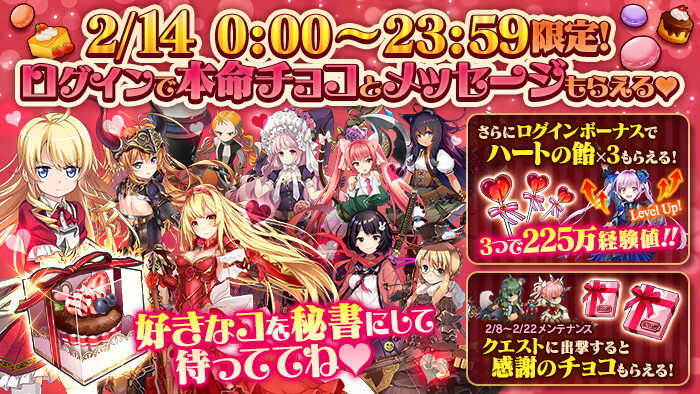 During this event, help the eight girls by collecting cocoa that have swarmed the city centre. 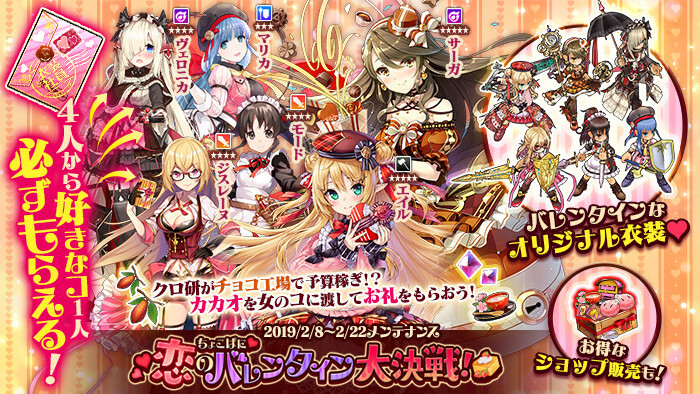 The Event Quests will drop [Limited] Cocoa which can be collected to help these girls. Visit the special event page to deliver these [Limited] Cocoa to the girls. After receiving a certain amount of [Limited] Cocoa, you will receive an item gift from the girl in return. ▼ Receive special presents from the girls! After receiving every gift from a girl, you will unlock that girl's scenario and receive a special present. After reading her scenario, you can begin helping the next girl, so aim to collect the presents from everyone. ▼ Unlock each girl's scenario! Unlocking and reading through each girl's scenario will increase cocoa and EXP you gain from the event quests! After helping ? and finishing her scenario, the epilogue scenario will unlock. ※ Scenarios that you have viewed will be available in [Memoirs] after the event ends, where you can view them at any time. Whenever you decide to go collect your rewards, they will appear in this same order. As such, if you've gotten any Fairy's Sweet Sake from your rewards, you will receive them first, then Magical Furnaces, etc. An Event Quest where you can collect [Limited] Cocoa, EXP, etc. A quest where you can test your might against the costume employees. There are no drops, but the first clear will award Shinestones. the Urgent Quest [Experience Forest] where you can get large amounts of EXP. When the Urgent Quest is available, an [Invitation Ticket] will be delivered to your in-game mail. This [Invitation Ticket] will unlock the quest for 30 minutes when used. ※ These tickets will expire 24 hours after they are distributed and must be used before then. Use the [Urgent] [Cocoa] Invitation Ticket to unlock the quest for 30 minutes. Drops a large amount of [Limited] Cocoa. Use the [Urgent] [Experience] Invitation Ticket to unlock the quest for 30 minutes. Gives a large mount of EXP. [Limited] Candy can also appear as a rare drop. The [Event Limited Recipe] can be obtained from the gifts you receive from the girls. ▼ Collect [Limited] Cocoa more easily with Valentine's Costume Employee Exclusive Weapons and Event Accessories! Equipping the following items in the event quest will lead you to a route where you can collect more [Limited] Cocoa. ※ You can obtain the recipes for Costume Employees by completing their character story. ※ You can obtain the recipe for the White Ring 2019 as a present from delivering cocoa. ▼ Thank You Chocolate Event! During this event, when you sortie to any map that costs Bread and clear it, you will receive a [Thank You Chocolate] message from your employees upon returning to the President's Office. [Thank You Chocolate] messages can be obtained once per employee. ※ You will not receive more than one message from one employee. It will only apply for the first time for that employee. ※ Does not apply to collaboration employees. ※ Prologue and Scenario only quests do not give [Thank You Chocolates]. ▼ Valentine Log-in and Secretary Valentine's Chocolate message! 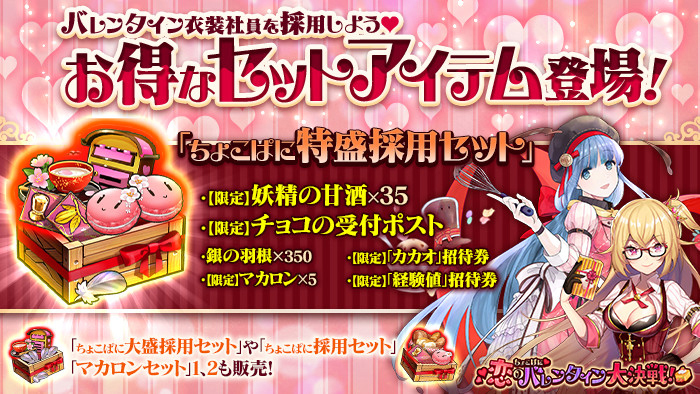 Log in during the specified time to receive [Valentine's Chocolate] from your [Secretary] (if unset, leader of Party 1). You will also receive this special log-in bonus in addition to the normal log-in bonus! ※ The [Message] and special log-in bonus can only be received once. ※ You cannot receive [Valentine's Chocolate] from collaboration employees. If your secretary and party leaders are collaboration employees, you can change them to a different emplyoee and move to the President's Office to activate the event. ※ You will receive a special message from your secretary with your first log-in so set your [Secretary] to your favourite employee. ※ If you are already logged in when the event begins, it will activate when you move to the President's Office. An item given to the girls as a present in the special event page. Recovers 1000 Food when used. Unlocks the [Experience] Quest for 30 minutes when used, which provides items useful for raising employees. Expires 24 hours after the distribution time. Please check the distribution times for more details. Unlocks the [Cocoa] Quest for 30 minutes when used, where you can collect large amounts of Cocoa. Expires 24 hours after the distribution time. Please check the distribution times for more details. ※ Limit 1 per customer. Last edited by Folseus; 02-08-2019 at 10:55 PM. What? A non-megane girl gets a megane version? Must have. Looks like another good chance to buy a few stones and get a black post. Log-in Bonus for one week. Log in every day to get a ★5★4 Valentine's Envelope (1x). Also, they "fixed" the rewards screen on the event page to display every instance of each item you get and in the random order you get them in so... It's a downgrade. And along with her various 5s dupes as usual. Thanks to events of this kind, my Charlotte now has maxed awakening. Perfect preparation for the upcoming boss update.